Even after baby grows up this blanket will still be the favorite. These delightful Animals are stitched on a pre-finished baby quilt. Printed X's show you where to place your stitches. Contains cotton thread, design printed in ink that fades with washing on pre-finished poly/cotton quilt, needle, and easy instructions. Finished Size: 34" x 43" (86 x 109 cm). Designed by: Tina Ledbetter..
Stitch this delightful stamped cross stitch baby quilt, and take a ride on the Baby Express with an array of friendly animals to keep you company. Kit contains cotton thread, design printed in wash-away ink on pre-finished poly/cotton quilt, needle, instructions. Designer: Debra Jordan Bryan.. This baby quilt would be a thoughtful gift any mother would cherish! Kit contains cotton embroidery thread, design printed on pre-finished poly /cotton quilt, needle and easy instructions. -- Finished Size: 34" x 43" (86 x 109 cm) -- Designed by: Ruth J. Morehead / Holly Babes ®.. Journey to Cuteland when you stitch this adorable baby quilt with its whimsical characters and quirky approach. Kit contains cotton thread, design printed on pre-finished poly/cotton quilt, needle, and instructions. Finished Size: 34" x 43" (86 x 109 cm). Designed by: Todd Trainer..
Baby's animal pals are peeking over the edge of a fanciful baby carriage. This adorable stamped cross stitch baby quilt is sure to brighten up the nursery. Contains cotton thread, design printed in wash-away ink on prefinished poly/cotton quilt, needle, and easy instructions. -- Finished Size: 34" x 43" (86 x 109 cm) -- Designed by: Pat Yuille / © 2008 Pat Yuille. Represented exclusiv..
Hello World Quilt. Printed X's show you where to place your stitches. Contains cotton thread, design printed in ink that fades with washing on pre-finished poly/cotton quilt, needle, and easy instructions. Finished Size: 34" x 43" (86 cm x 109 cm). Designed by: Cathy Heck..
Keep your little one cozy and warm with these happy critters. Animals of all shapes and sizes are featured on this stamped cross stitch quilt. Contains cotton thread, design printed in wash-away ink on prefinished poly/cotton quilt, needle, and easy instructions. -- Finished Size: 34" x 43" (86 x 109 cm) -- Designed by: Wendy Bentley / © Olika Licensing, Inc. / Wendy Bentley..
Use stamped cross stitch to create this endearing Noah's ark baby quilt. Colorful critters are peeking out all around the ark in this classic baby motif. This design is sure to brighten baby's nursery. Our kit includes a prefinished quilt printed in ink that fades with washing, cotton thread, and easy-to-follow instructions. Kit contains cotton thread, design printed in ink that fades with washing..
Pet Friends Quilt by Dimensions in stamped cross stitch features a happy puppy and kitty. This bright and cheery design makes a wonderful shower gift. Finished size: 34" x 43". Designed by Makiko. Artwork by Makiko. Courtesy of www.image-source.co.uk. This stamped cross stitch kit contains: • Presorted thread • Design printed in wash-away ink on prefinished quilt (50% cotton / 50% polyester) .. Your precious little one can snuggle up with an angel and a teddy bear. What better friends can one have? Kit contains cotton embroidery thread, design printed on pre-finished poly/cotton quilt, needle, and easy instructions including a color accented chart. -- Finished Size: 34 x 43 (86 x 109 cm) -- Designed by: Ruth J. 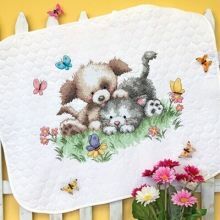 & Bill D. Morehead / Holly Babes..
Snuggle up with these adorable baby animals on this stamped cross stitch baby quilt. Contains cotton thread, design printed in wash-away ink on prefinished poly/cotton quilt, needle, and easy instructions. -- Finished Size: 34 x 43 (86 x 109 cm)..